Some Home Base Holidays members have already responded to PhD student, Alexander Grit's, recent request for volunteers willing to record their home exchanges for use in his research for his thesis (there will be an update in the newsletter out tomorrow). Then, yesterday, I received another similar request (below). Who would have thought a few years ago that home exchange would become so popular as a subject for academic research! My name is Nathalie, a Belgian student in tourism, and I am doing my thesis on Home Exchange. I would like to thank you for your blog and your newsletters, as they have helped me find confidence in finishing my thesis because of the lack of information on the subject. I'm not fluent in english, and finding information in french is very hard. I was also surprised to see that someone else, Alexander Grit, was working on home exchange as well! I was wondering if, by any chance, you could help me with some questions. 'My name is Nathalie Warny and I am a Belgian bachelor student in Travel and Tourism Management at the Charles Peguy Institute in Louvain-la-Neuve (a university campus). I am doing my thesis on the impact Home Exchange has had on the travel industry. I am also working on building a fictional label of quality and an online database of websites devoted to home exchanges with exchangers reviews, rankings, etc. How did you discover home exchange? Were you anxious before your first experience? With your experience, have you come up with a list of "things to do and not to do before, during and after the exchange", to set the limit of the exchange? Do you often keep contact with the family you exchange homes with? Have you ever heard about experiences that went really bad? Or encountered problems with organising exchanges? Would you exchange your house with a family living in Belgium? If you are prepared to answer a few questions for Nathalie, please send a message including 'for Nathalie Warny' in the subject line and I will forward it to her. Nine Long Haul Home Exchanges in 12 Months: Is This a Record? 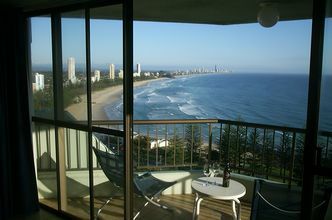 Luxury 120sq/m, 14th floor apartment located on the Queensland Gold Coast at Burleigh Heads. Breathtaking unimpeded, panoramic views of the ocean and beaches. Family area offering patrolled surf beaches, restaurants, walking distance to local shops and transport. Complex has heated swimming pool, sauna spa BBQ, tennis courts. Adjacant National Park. 100m from beach. See the full exchange offer and more photos, HE17298. In the last issue of Home Swappers Newsletter, I asked for volunteers to review a new e-book, 'Home Exchange Academy'. Several readers responded and two were chosen at random - an experienced home exchanger and a newsletter subscriber who had not swapped homes. I’m an addicted browser (read "dreamer") of home exchange websites so I leapt at the chance to read and review the new e-book, subtitled: "Blueprint to Swap Homes for Your Next Vacation and Get out of the Hotel Rut". Sadly, I was disappointed. My overall impression? This 68 page book was hastily thrown together and could benefit from some careful editing. Both the book and the associated website include spelling errors. And, while the book includes much useful information, it also includes material that seems like filler of only tenuous interest to prospective home exchangers. The author seems to know this. She predicts at the beginning of "General Tips and Advice" that "[t]his section of my e-book may sound a little strange." She’s right – the section is an awkward mix of tips relevant to home exchangers and other tips that would only be of use to someone who’s never traveled before – hardly the typical home exchanger. The book does contain some very good advice on how to evaluate a home exchange club before joining. The author advises readers to explore each club’s website, check out contact info (and call or email the club to see how fast and helpful is the response), and look for clubs that focus on exchange rather than rentals. The author also offers useful cautions about avoiding clubs without membership fees or lacking security features to protect members’ contact information. The latter advice, however, is inconsistent with her suggestion that you post your children’s photos on your listing. Something else I wouldn’t have thought of is the author’s advice that you record the "knocks and dings" in your own house before you leave so that your exchange partners won’t feel responsible for damage they haven’t caused. And I hadn’t thought of the possibility of including photos of interesting sites in my city or neighbourhood. Having drifted around the web, I know that similar information is available at no cost on the websites of many home exchange organizations. But, if you’re looking for a quick overview and an example of home exchange documents, then this book is a convenient place to start. The website promises that purchasers will get updated versions of the book at no cost. Here’s hoping that the author takes the time to refine a promising first draft into a more substantial book. 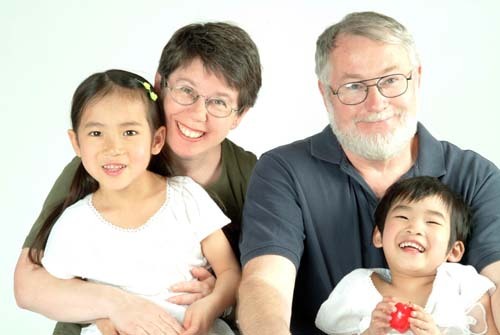 Catherine & family, based in Toronto, Canada, are experienced travelers who stay in accommodation with cooking facilities whenever possible. One of these days, they’ll get their act (and digital photos) together and actually post a home exchange listing. Where do they want to go? Shanghai, Beijing, Venice, Texas, California, Scotland and anywhere else interesting. See the 'Home Exchange Academy' website for further information and to order the e-book, $19.99US(+tax). Home Exchange: Confused by Dates? Dates Available - these are the dates that a member wants to arrange an exchange and are shown as ranges of dates, e.g. Mar 08 - June 08 would indicate that the member wants an exchange some time during this period (the length of exchange is shown separately). A listing may show more than one range of dates as members can often consider exchanges at different times during the year. When a member can be flexible on dates, Dates Available will show as 'Open to Offers'. What to look out for: Dates Available, when shown as a range of dates, should always include the year. If only months are shown, there's no way of knowing if the member wants an exchange this year, next year - or had wanted an exchange last year or the year before. Join or Registration Date - this is the date a member joined or renewed and is important as it clearly shows how long the listing has already been in circulation. Expiry Date - this is the date the listing will expire and, if not renewed on or before this date, should no longer be displayed. This is a very important date as, viewed in conjunction with the Join date, you can see at a glance how long any listing will be in circulation. What to look out for: no listings with expired dates or very out of date exchange date requests should be shown. Members are generally most active in looking for exchanges during the first few weeks of their membership and very long membership periods can mean that many older listings in circulation are no longer available. It is for this reason that the longest Home Base Holidays membership period is two years. Members who want to arrange further exchanges renew their listings on or before the expiry date. Note: join and expiry dates are details that you should be able to see in all listings before joining. Without this basic information, you have no means of telling how up-to-date listings are, and, if this is the case, total numbers shown are next to useless as an indication of how likely you are to arrange an exchange. Listing Updated: Home Base Holidays members can update their listings whenever needed. The last date a listing was updated is not included in our listings for the simple reason that this is not nearly as important as Join and Expiry dates. What to look out for: don't confuse Listing Updated with the Join/Registration date. Listing Updated merely means that the member (or site owner) has changed the listing in some way on this date, and this 'updated' date could be many months after the member had joined. New Listings - these are the listings of members who have joined or renewed recently. What to look out for: listings, described as new, should not be a mixture of new and older listings that have recently been updated unless this is clearly indicated. The separate New Listings on Home Base Holidays are members who have joined or renewed in the last 31 days and are listed in order of joining, with the newest listings shown first in search results. Last Minute Offers/Hot List: members who are looking for exchanges soon, usually within the next three months. This is a follow up from the member's home exchange report published yesterday (catch up with the story in the post below). 'We usually swap with a different size group than ours but we thought our home exchange guests would use four bedrooms to have one each but not every bed! She has since mailed back and apologised for not knowing it was a 4 for a 4 swap (I corrected her on this as 5 was fine with us and had been agreed but pointed out the code of using what you need in an exchange home, not everything available!) She said she thought an exchange meant that she could fill the house how she pleased!! LS: As it was the daughter and her family, not a listed member herself, who took part in this exchange, it sounds like the daughter hadn't quite understood the concept and her own responsibilities as a good home exchange guest. This is a warning to any other members to take extra care if contemplating a swap with a relative of a listed member rather than directly with the member who will be more aware of her responsibilities to exchange partners. Bed Too Soft, Too Hard, Just Right? Don't be a Goldilocks on a Home Exchange! Or, Who's Been Sleeping in All My Beds? Q: We have had a home exchange where the other party asked if their daughter and family could do the exchange and not the actual owner of the house listed on Home Base Holidays. This we agreed to and our party of four agreed to swap with their party of five. Both of us completed great swaps but we have just heard from our "caretakers" who do a "meet and greet and laundry service" at our French house (for which we pay them) that the other family took an extra person with them and used every bed in the house and so they had 6 instead of 5 to clean up after and 6 beds were used instead of the 4 that we were expecting (apparently their daughter decided to sleep in various beds whilst there), not to mention the extra cost of gas / water / electricity to us who had already accepted a larger exchange party than our own. Am I being unreasonable to think this is a very cheeky thing to do without asking when this is our second home, not a villa they had rented for a week?? A: It is very cheeky and you aren't being unreasonable. For a start, it's never acceptable to invite an additional guest to an exchange home without getting permission from the owners first. It certainly seems reasonable not to have expected your exchange guests to try out all the beds and thus create additional laundry, especially when they didn't even have to do the laundry themselves! Hindsight is a wonderful thing but it might have steered the exchange family away from the tempting extra bedrooms if your caretakers had been told to put notices on the doors of these no-need-to-be-used rooms. Most home exchangers expect to do the laundry and make the beds before leaving an exchange home and it sounds like your guests rather took advantage of your generosity in arranging to have your caretakers provide a laundry service for them. I am glad to hear that you had a great swap. The follow-up from the member to this story continues tomorrow.